Call this number if you are abroad, or if you are having any emergency issues before you’ve departed on your holiday. This is the quickest way to contact Love Holidays in an emergency. A member of staff will quickly be able to help you with any issues you are having. Love Holidays provide information on their website about what to do if you are in an emergency so make sure you check this out too. 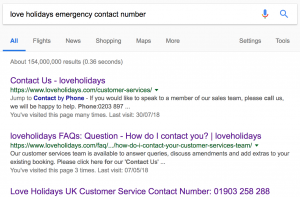 A quick search online for “Love Holidays emergency contact numbers” actually brings up the normal customer service number, instead of the emergency number. This is the reason we have compiled all of the emergency numbers for Love Holidays. Our number listed on this page will get you in touch with the Love Holidays emergency contact number so somebody can help you quickly. Unfortunately the number they provide for emergencies isn’t 24 hours. Instead you are asked to leave a voicemail detailing your issue. They ask you to quote your Love Holidays booking reference, and don’t forget to leave them details on how to get back in touch with you. There is some handy information here on what to do if you have a bad holiday experience. This gives you information that can help you in an emergency situation. Because the emergency number Love Holidays provide isn’t operational 24 hours a day, the next best option is to email them your issue. This isn’t as likely to get a quick response. However you can detail more information about your issue and it leaves a paper trail about the issue you’re having. The social platform Twitter can be used if you need to contact Love Holidays in an emergency. Although this isn’t manned 24 hours a day, the response times are very quick. So if you find your self in a situation with limited phone signal, but you have WIFI, then it could be a good option. There are many other ways to get in touch with Love Holidays. We have a dedicated webpage about all of the best Love Holidays contact numbers and there are even more ways to get in touch too.